Slaughtneil's Karl McKaigue was superb for the reigning champions against Newbridge. There was never the hint of a shock as county champions of the past two years, Slaughtneil, eased past a Newbridge team that was relegated from senior football this season. Slaughtneil spurned half a dozen goal chances but part of that was down to the excellent goalkeeping of Stephen Bateson. There were times when the holders would have infuriated their mentors by over playing the ball and when they meet the winners of Ballinderry and Banagher in the semi-final, this type of display will not take them to the final. The game was a pretty flat affair with Slaughtneil keeper Anton McMullan having little to do. Brendan Rogers at full back was excellent in the Slaughtneil defence but the most accomplished player on the park was corner-back, Karl McKaigue. Padraig Cassidy did well at midfield but the normally high scoring attacking unit was hit and miss. Cormac O’Doherty was the pick of the front six while Shane McGuigan picked off some fine scores from frees and open play. Bateson, the burly Newbridge goalie, saved his team from much heavier defeat. In defence Delcan McKeever and Nathan Rocks battled hard while in attack Danny Mulholland was always dangerous. Michael Bateson in midfield showed touches of class. Newbridge decided to give it a lash from the first whistle and they took an early lead when Peter McGrogan sent over a free after a foul on Michael Bateson. That lead did not last long as Slaughtneil split their defence for big full forward Se McGuigan to take a Cormac O’Doherty pass and slip the ball to the net. The Newbridge defence was resisting stubbornly but there was nothing they could do when Shane McGuigan pointed a long distance free after five minutes. Eamon Burke missed with a long range effort and Se MGuigan spurned another goal chance. Excellent points from Shane McGuigan and a brace by Cormac O’Doherty eased the champions into a 1-4 to 0-1 lead after fifteen minutes. Newbridge staged a mini rally with a pointed free from Ryan McElhone and a similar score from Peter McGrogan. The experienced duo of Paul Bradley and Ryan McElhone exchanged converted frees as Newbridge clung to the coat tails of the game despite Slaughtneil hogging possession. As the end of a dreary first half approached Shane McGuigan pointed a free but two minutes into added time Peter McGrogan got the ‘Bridge’s first score from play to leave them 1-6 to 0-5 behind at the break and not entirely out of it. Slaughtneil stepped up a gear on the resumption and hit three points in the opening four minutes from Paul Bradley (free) Shane McGuigan and another Bradley free to open up a seven point gap.Midfielder Patsy Bradley then picked off a rare point. A brilliant save from Bateson prevented a Cormac O’Doherty goal. Shane McGuigan from a free extended the Slaughtneil lead. A good Newbridge foray ended in a Danny Mulholland point but Slaughtneil hit back quickly with a Cormac O’Doherty point and one from Christopher Bradley who was having an unusually quiet game. Chrissy McKaigue underlined Slaughtneil’s wastefulness with a quite awful attempt at a point which went nearer the corner flag. The scoring died down as both teams just went through the motions and when Francis McEldowney rattled the Newbridge crossbar it was the fifth missed Slaughtneil goal chance. After a spate of wides at both ends the scoring resumed when Paul McNeill set up sub Ronan Bradley to make the score 1-13 to 0-6 with ten minutes left on the clock. A Paul Bradley free five minutes from the end concluded the Slaughtneil scoring. The recently relegated Newbridge went out defiantly with the last two scores of the game from Declan McKeever and Danny Mulholland. Next year they will be playing intermediate football but have enough good players to make their stay in Division Two a short one. Slaughtneil scorers Shane McGuigan 0-5 (3f), Se McGuigan 1-1, Cormac O’Doherty 0-3 and Paul Bradley 0-3f, Christopher Bradley 0-2 0-1’45 and Ronan Bradley 0-1. Newbridge scorers Peter McGrogan 0-3 (2f), Danny Mulholland 0-2 and Ryan McElhone 0-2f and Declan McKeever 0-1. 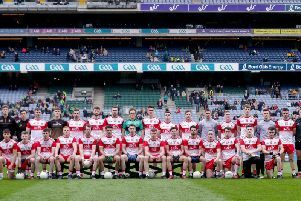 Newbridge:Stephen Bateson, Declan Mckeever, Conor McGrogan, Cairan Brooks, Nathan Rocks, Gerard Burke, Dessie McColgan, Eamon Burke, Michael Bateson, Odhran McGlone, Niall Sweeney, Conor Doherty, Danny Mulholland, Peter McGrogan, Ryan McElhone.